Six years ago, when Steve Presland was offered the chance to project-manage the building of a new apartment block in Newquay, both he and Jane jumped at the opportunity of a new adventure. Steve had been working in London and lived in Bedfordshire with Jane, but the couple had always dreamt of living by the sea. On the moving day in August, the couple packed all their belongings into a rented truck and headed down to Polzeath in north Cornwall, where they would be living in a rent-free flat that came with Steve’s job. The couple quickly took to their new life in Cornwall, getting married in the nearby St Enodoc church. Returning from honeymoon, they decided that they wanted to make the move to Cornwall more permanent, and started looking around the local area for a property to buy. ‘Even though Steve’s original contract was only for four years, we had fallen in love with life here and couldn’t imagine moving away,’ says Jane. The cow barn forms part of a small development of farm buildings, converted around 10 years previously by the owners of the main farmhouse, which sits behind the couple’s home. The finished interior wasn’t at all to the couple’s taste, however. The walls had been rendered to look rustic and there was a deep-pile green carpet throughout. Painted designs of Bart Simpson and Superman featured on one bedroom wall, the bathroom was little more than a shower room, and the kitchen was dated and basic. The couple could see past the interior, however, and were quick to spot that they could give the property a more modern makeover. ‘There was a separate utility area at one end of the kitchen, which could only be accessed from outside the property. 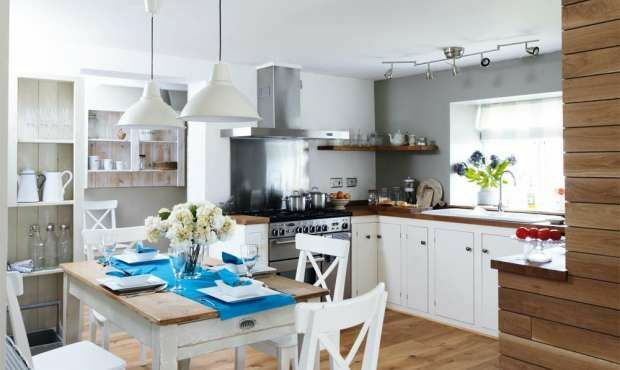 By removing a wall between this area and the kitchen, we could see that it would be easy to create one large open-plan kitchen and living space, which we felt would be better suited to the house, too,’ says Jane. Following a successful purchase, the couple moved into the house and continued to live there for the duration of the six-month project as they didn’t want to pay out for rent as well as their mortgage. Steve also decided to put his knowledge of the building trade to good use by managing the whole project himself, using his contacts to bring in electricians, plumbers and carpenters as and when required. ‘Anything labour-intensive, such as ripping out the old bathroom, Steve did himself as we didn’t need to spend money bringing in trades for this sort of thing,’ explains Jane.